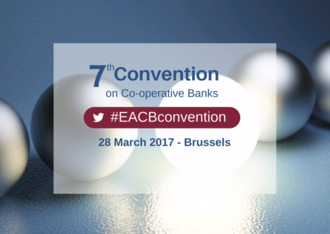 The 6th Convention on Co-operative Banks 'The Co-operative banking difference towards economic growth' took place on Tuesday 3rd March 2015 at 'La Bibliothèque Solvay' in Brussels. The 5th Convention on Co-operative Banks titled "Co-operative banks : reconciling economic and social needs" took place on the 6th December 2012 at the Bibliothèque Solvay in Brussels in the context of the United Nations’ International Year of Co-operatives (IYC). Click on READ MORE to access videos, pictures and documents. In the aftermath of the financial crisis and at the start of a new legislative mandate for the European Commission and the European Parliament, the 4th Convention was the occasion to promote co-operative banks and their specific business model in a changing context. Every year the EACB is taking part as partners in big international events: summits, forums, conferences and regulatory debates. We are also organising every year the Academic Conference and every two years a convention on co-operative banking.